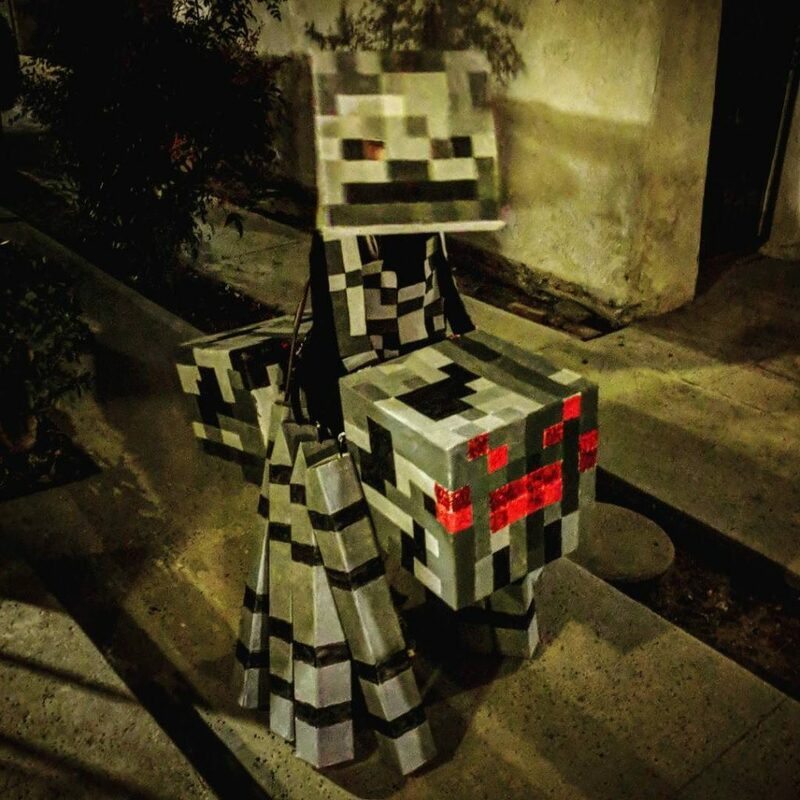 Homemade spider jockey costume (a composite Minecraft monster consisting of a skeleton archer riding a giant spider). Kid-sized, built by Katie (I assisted, mainly with painting, but the design, planning, and most of the construction was her). Mostly cardboard, covered with paper to smooth it out and provide a painting surface. Heavy fabric and dowels to form the frame for the center of the spider body, with paracord to hold the legs on. For the skeleton: felt panels, some pinned to a black shirt, some to the suspenders. Which, incidentally, were made from old Comic-Con lanyards. This entry was posted in Games, Photos and tagged costumes, halloween, minecraft on October 31, 2017 by Kelson. 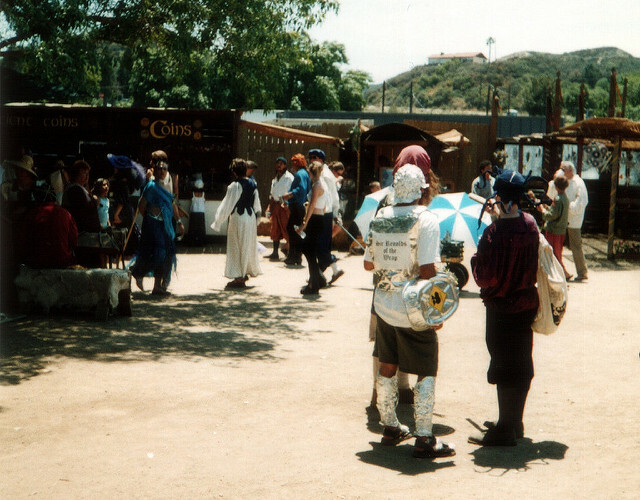 This entry was posted in Highlights, Humor, Photos, Sci-Fi/Fantasy and tagged cosplay, costumes, foil, RenFaire on November 30, 2009 by Kelson. 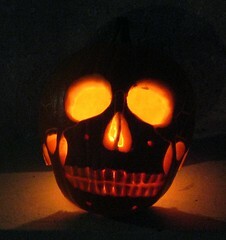 Katie carved this incredible anatomically-correct skull Jack-O-Lantern for Halloween today. 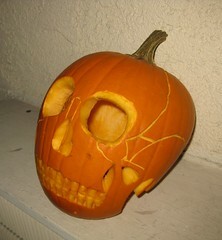 Update: Check the comments for her writeup on how she carved it. It seems to have worked as a “yes, we’re handing out candy” signal. Last year we didn’t get any trick-or-treaters. 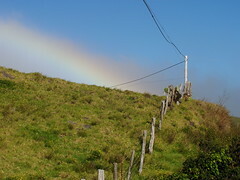 (We also didn’t put up any decorations that year, either.) This year, they started arriving while I was taking photos of the pumpkin…and while Katie was opening the bags of candy! 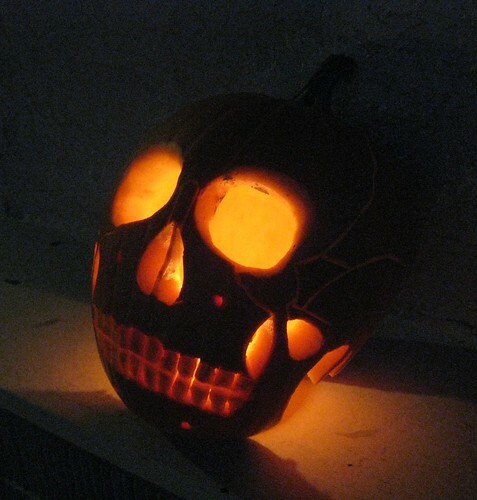 By 8:50 we were down to only three Starbursts left to hand out, so we brought the pumpkin inside and called it a night. Earlier this afternoon, I ran some errands and deliberately went to the Spectrum so that I’d have a chance of spotting the Great Park Balloon in the air while it still had the Jack-O-Lantern face on. 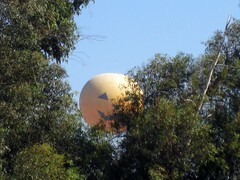 I thought this view made for a nice image of the Great Pumpkin, rising up over the trees. 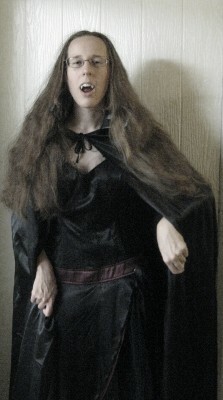 This entry was posted in General, Photos and tagged costumes, halloween, overheard, pumpkin, skull, vampires on October 31, 2009 by Kelson. 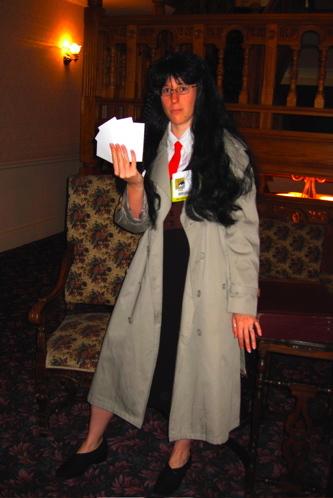 Katie’s hall costume for the day: Yomiko Readman, Paper Master — from the anime series Read or Die. Friday was a good day for costumes at Comic Con. 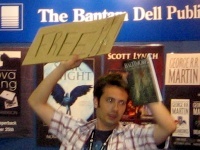 This entry was posted in Comics, Conventions, Photos and tagged anime, Comic Con, Comic Con 2008, cosplay, costumes, SDCC on July 25, 2008 by Kelson. 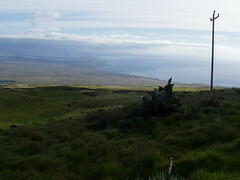 I wanted to call this “Oddball Comic-Con,” but decided that might be a little too close. Stormtrooper Elvis has become such a fixture that I almost didn’t bother taking a picture of him when I saw him this year… but then I noticed his pose, and the Sauron statue in the background. There were a number of people walking around with “Free Hugs” signs, most of them women, but a few men. I never actually saw someone take one of them up on the offer, though. At one point I looked upward at the ceiling of Ballroom 20. 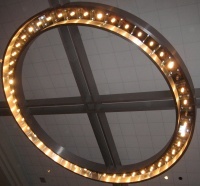 With The Dark is Rising being made into a movie, I saw this lighting fixture and cross-beams and immediately thought of the Sign of Fire. This guy had the ultimate cheap costume: A roll of tape. 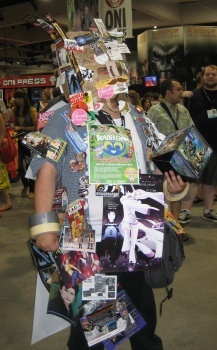 He just took every freebie flyer that was handed to him, and taped it to himself. There was a group of women in identical red dresses, with identical hairdos, and identical shoes. I saw a few of them wandering the floor on Saturday, but didn’t realize just how many there were until we left the convention center for dinner, and saw them crossing the street. Edit: Mystery solved? The Resident Evil panel featured 17 Milla Jovovich doubles wearing her iconic red dress. This looks like more than 17, and the dresses don’t seem to be ripped in the right place, but this could be them. Continued in Strange Sights of San Diego. 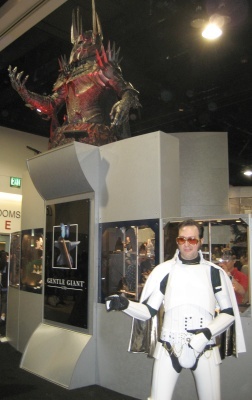 This entry was posted in Conventions, Only in San Diego, Photos, Strange World and tagged Comic Con, Comic Con 2007, cosplay, costumes, Elvis, San Diego, SDCC, Star Wars, Stormtrooper, weird on August 3, 2007 by Kelson.